It was a particularly interesting visit to Mas de Tourelles. Compared to most vineyard visits, where I talk about varieties, terroir, temperature control, yeasts and filtration, this tasting concentrated on how the Roman recipes were followed in an attempt to re-create the style of wines made during Roman times. The domaine has been a wine producing domaine since Roman times. It lies along the Roman road, via Domitia, which connected Italy to Spain and was once upon a time part of a thriving commerce. In 1991, when Herve Durand, a wine maker and archaeologist, discovered a Roman cellar in the south of France. He then met up with Andre Tchernia, a research director from the prestigious Social Studies High School, who is familiar with all that Roman authors have written on this subject and Jean-Pierre Lebrun who manages the French Archaeology Centre of Napoli, and has excavated many Roman villas with wine cellars. Archaeological excavations at Tourelles have found evidence of the Roman villa and cellar and the domaine has whole-heartedly thrown itself into the Roman world. They have re-created a Roman press and have a Roman wine press day with volunteers dressed in white tunics pressing the grapes. 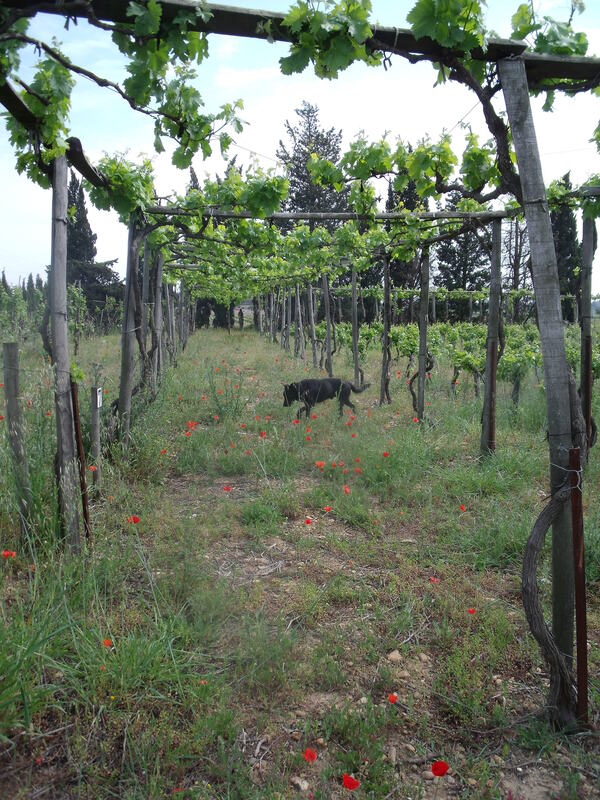 It is possible to walk around the vineyards and see the different forms of trellising being trialled. Vines climbing up the trees looks very picturesque but maybe less practical. 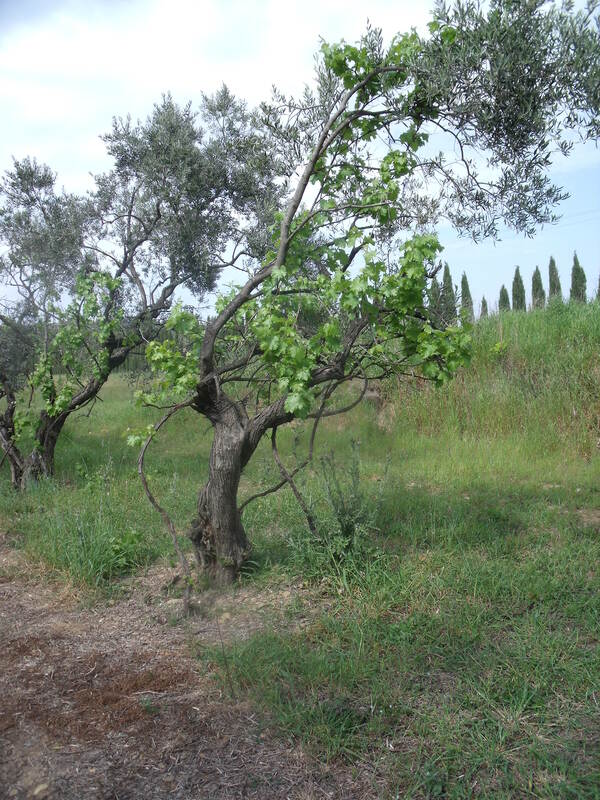 Vines trailed high on trellis was an Etruscan method. The grapes hanging down below the leaves were sheltered from the burning sun and there was space below for other crops, making as much use of the land as possible. 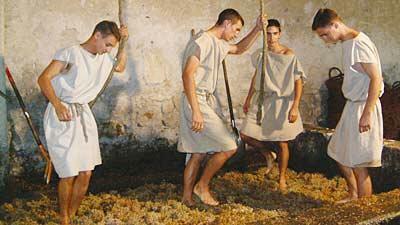 After ten years of research, they studied the recipes and the methods for making Roman wine. Work was done to re-create a Roman vineyard and wine cellar and to apply the vinification recipes found in Roman works including those of Apicius, Cato the Elder and Columella. Three different wines are made, Turriculae, Carenum and Muslum. One of Cato’s recipes includes the additions of sea water, but if the vineyard is too far from the sea, he suggests making up a brine to mix with the wine and then letting the wine age in amphorae placed in the sun for two years. The resulting wine will taste like the wine of ‘Coan’. Tourelle use a similar recipe from Columelle which also includes fenugreek and iris root. The resulting wine, Turriculae, tastes similar to a fino sherry or vin jaune. Carenum, a white wine blended with defrutum (grape must, with the addition of a few quince, boiled down to a third of its original volume, like vin cuit), is rich and sweet. Muslum is wine sweetened with honey and spices. 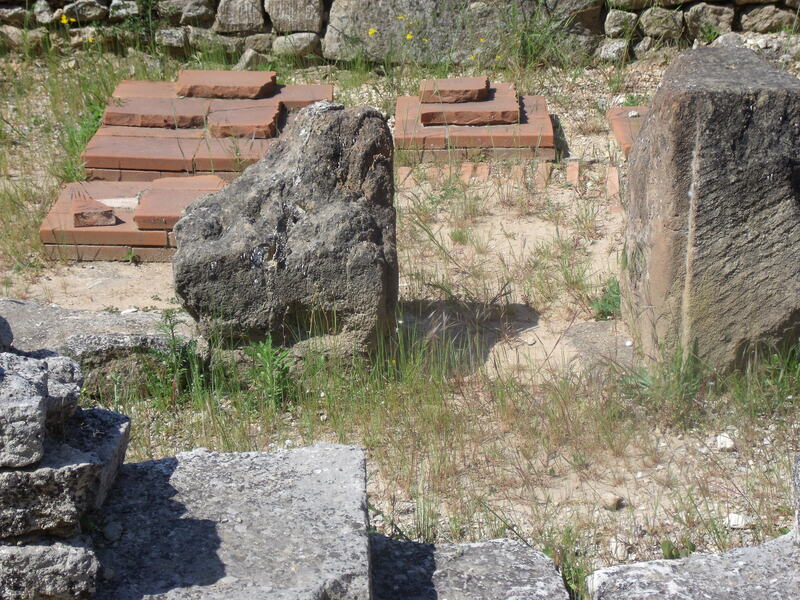 At the Roman town of Glanum, east along the via Domitia, on the other side of the Rhone river, we saw evidence of another style of Roman wine making, with the remaining pillars which supported the floor of the fumarium. 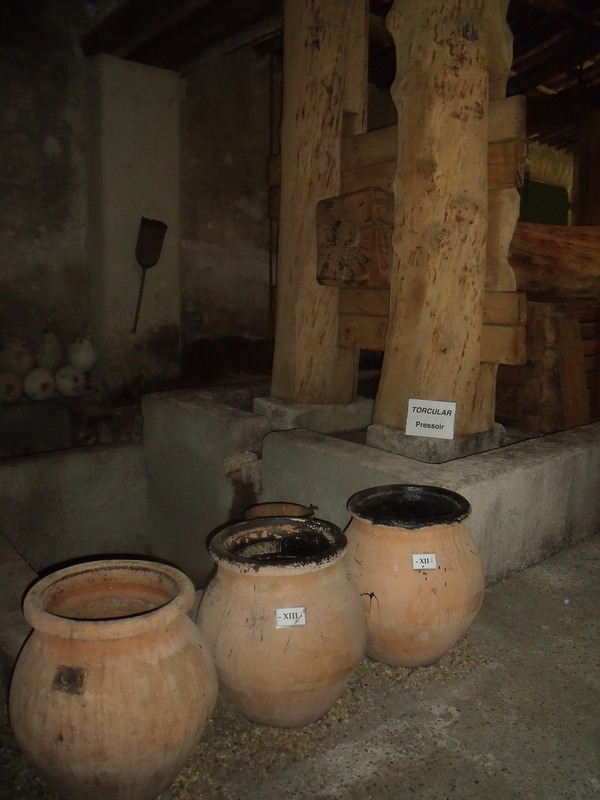 Wine would be stored in amphorae in the room above the smokers and smoked to create a mellow, mature tasting wine.